Egypt's foreign minister Sameh Shoukry met on Thursday in Cairo with Alistair Burt, the UK's minister of state affairs for the Middle East and North Africa, where they discussed the war against terrorism and the latest developments in the Middle East, the Egyptian foreign ministry said in a statement. The two ministers discussed consultation and coordination between Egypt and Britain on regional issues, including the Israeli-Palestinian peace process, and finding solutions to end the crises in Libya, Syria, Yemen and Iraq. Burt said that although London has not yet resumed direct flights from the UK to the Sinai resort city of Sharm El-Sheikh, British tourism to Egypt has increased 60 percent in 2017 compared to the previous year, according to the statement. The UK imposed the ban in late 2015after a Russian passenger jet crashed shortly after taking off from Sharm El-Sheikh International Airport, killing all 224 people on board. 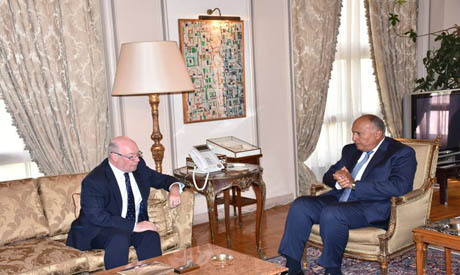 Burt told Shoukry that Britain values its economic relationship with Egypt, saying the UK remains the largest foreign investor in the country. Shoukry briefed Burt on the new security measures Egypt has implemented at its airports since the 2015 crash, urging the UK to resume flights to Sharm El-Sheikh as soon as possible. Burt's visit to Egypt comes as part of a Middle East tour that included Israel and the Palestinian territories of the West Bank and Gaza. On the eve of his first visit to Cairo, the British minister penned an op-ed published in Egypt's Al-Ahram daily newspaper where he talked about British efforts against terrorism domestically and internationally, as well as the UK's keenness to respect civil and religious freedoms while countering extremism. "Britain will not leave Egypt and its neighbours alone in the fight against terrorism; the UK has sent hundreds of military missions to liberate Iraq and Syria from Daesh's control," Burt wrote in Al-Ahram. "Although Britain has not decided to ban the Muslim Brotherhood organisation as other countries have done, the UK has tightened monitoring on the activities of the group and visa requests by its members, and is also monitoring sources of funding for the Brotherhood," Burt said in the op-ed. Egypt banned the Muslim Brotherhood organisation in 2013, designating it a terrorist group, and has called on the UK and all Western countries to do the same. On Thursday evening, Burt met with interior minister Magdy Abdel-Ghaffar to discuss various regional and domestic security issues. Abdel-Ghaffar discussed with Burt Egypt's efforts to secure its various ports and touristic destinations.